ARCADIA, CA—Famed actress and activist Angelina Jolie wowed Grindside Street Comp spectators Sunday in her first public aggressive inline skating competition since undergoing a preventive double mastectomy earlier this year. 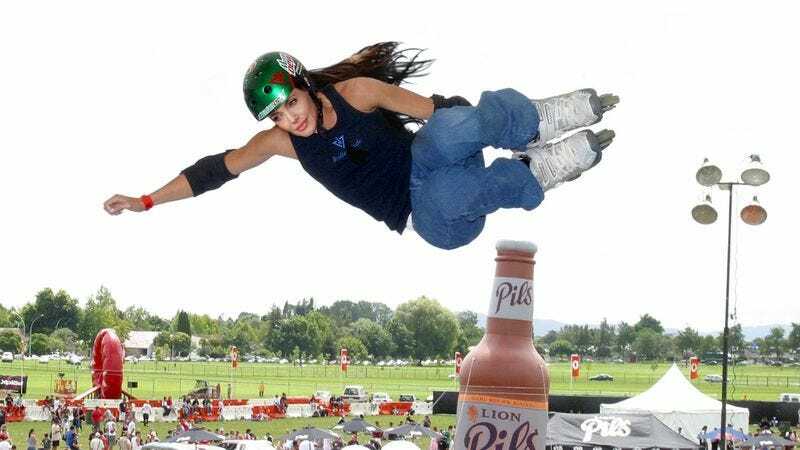 “I think a lot of people were wondering what it would be like when she got back out there on the half-pipe again, but her performance was flawless—she’s a world-class blader, and she proved it today,” fellow women’s vert competitor Cecilia Gonzales said of 37-year-old Jolie, who reportedly dazzled the crowd with an inspiring arsenal of stunts including a top-acid turn, an alley-oop unity, and a stunning double backflip. “When she opened with a frontside I figured she was just going to take it easy, but then she goes and pulls a sick mizou with a 540 hurricane. And I was just like, ‘Damn. Still got it.’” When interviewed after receiving third place in the women’s vert event, Jolie told reporters it was great to be back and urged young skaters to consider the importance of proper training and protective gear.